Worst Cooks In America will return to the Food Network on Sunday, January 4th at 9pm for its sixth season. The season will be seven episodes long, and the prize will be $25,000 for the contestant that makes the most impressive culinary transformation. The sixth season will feature a new chef going against Anne Burrell as Tyler Florence will be mentoring one of the teams. This comes as a bit of a shock as the casting site for season 6 had Anne Burrell vs. Bobby Flay, and they were also trying to cast people who had a crush on Anne Burrell or Bobby Flay. Perhaps Bobby Flay has a scheduling conflict for when the season was filmed? 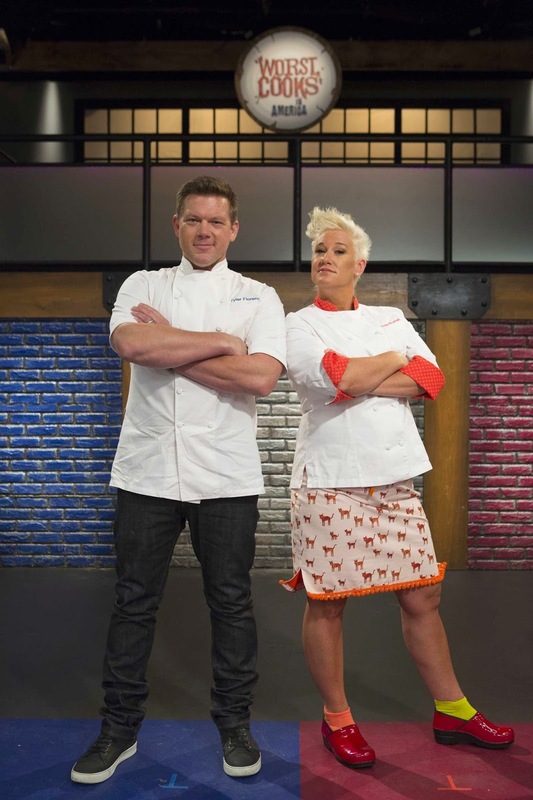 NEW YORK - November 20, 2014 - Worst Cooks in America, the hit competition series that transforms kitchen disasters into confident cooks, is back for a sixth season on Sunday, January 4th at 9pm ET/PT with returning Chef Anne Burrell going up against first-time opponent Chef Tyler Florence. In the seven-episode series, Anne and Tyler each lead a team of kitchen-challenged recruits in a grueling culinary boot camp designed to turn them into skilled cooks. A $25,000 grand prize is awarded to the contestant who makes the most impressive culinary transformation, in addition to delivering victory and bragging rights for their team leader. "Welcoming a new roster of Worst Cooks is an annual tradition, and our viewers love watching their comical kitchen mishaps evolve into serious cooking chops," said Bob Tuschman, General Manager and Senior Vice President, Food Network. "Anne and Tyler are both fiercely competitive and determined to whip their contenders into tip-top culinary shape, and the transformations are remarkable." In the season premiere, an open call brings some truly horrible cooks to the table to meet Anne and Tyler. Fourteen new recruits are selected for boot camp and each presents their signature dish, then contestants are divided into Team Anne and Team Tyler. In lesson one, recruits must make the ultimate romantic meal. Anne's red team tackles Roasted Chicken with Israeli Couscous and Pomegranate Sauce, while Tyler's blue team makes Chateaubriand with Mashed Potatoes and Roasted Mushrooms. The least successful competitors from each team are sent home, while the remaining 12 move on to the next challenge. Upcoming episodes feature a food trivia game, international taco themed competition and a breakfast menu challenge with special guest, Good Morning America Chief Meteorologist and resident foodie Ginger Zee. The season culminates in a finale on Sunday, February 15th at 9pm ET/PT where the most improved recruit is awarded a $25,000 grand prize. Viewers wanting more can visit FoodNetwork.com/WorstCooks for behind-the-scenes photos, interviews, easy cooking tips and more insider coverage. Fans can also connect with each other on Facebook at Facebook.com/FoodNetwork and on Twitter with the hashtag #WorstCooks. FOOD NETWORK (www.foodnetwork.com) is a unique lifestyle network, website and magazine that connects viewers to the power and joy of food. The network strives to be viewers' best friend in food and is committed to leading by teaching, inspiring, empowering and entertaining through its talent and expertise. Food Network is distributed to more than 100 million U.S. households and up to 35 million unique web users monthly. Since launching in 2009, Food Network Magazine's rate base has grown tenfold and is now the second largest monthly magazine on the newsstand, with over 11.6 million readers. Headquartered in New York, Food Network has a growing international presence with programming in more than 150 countries, including 24-hour networks in the United Kingdom, Asia, and the Europe, Middle East and Africa (EMEA) region. Scripps Networks Interactive (NYSE: SNI), which also owns and operates Cooking Channel (www.cookingchanneltv.com), HGTV (www.hgtv.com), DIY Network (www.diynetwork.com), Travel Channel (www.travelchannel.com) and Great American Country (www.gactv.com), is the manager and general partner." Here are the episode descriptions for this season, and here are the descriptions of the contestants from the press release at multivu. I haven't had a chance to Google the contestants yet, but there are usually a few on the show that have been on TV before. This show really got silly last year as the cast actors and people acting like silly characters. I odn't know. Based on his mentoring performance in the home-cooks competition, Tyler doesn't seem to have the teaching chops that Anne does. I'd like to see her go up against Michael Symon, who has more than proved his abilities as a teacher. I'll miss Bobby. He's my favorite, but Tyler will be good. He was such a good teacher on his Food 911 show. I also thought Tyler got pretty impatient with the people he was instructed on America's Best Cook. Hopefully this is the beginning of the Food Network phasing out Bobby Flay. Considering how much of a jerk he comes across as on the air, he must be a real monster in person. Tyler's okay...I'm not a huge fan. This show will not be the same w/o Bobby. So disappointed to hear this. I love Bobby and never tire of watching him like I do all the other regulars on Food Network. I thought he came off as a jerk earlier in his career, but he seems very grounded and self-assured while also somewhat humble now. I will say, though, that I do not like his new show, "Beat Bobby Flay." It seems completely contrived and rigged. I have nothing against Bobby, but I can't stand Beat Bobby Flay either. That show really is a joke. No Bobby? I don't know about that. Tyler didn't seem to be a very good instructor on his last competition show.